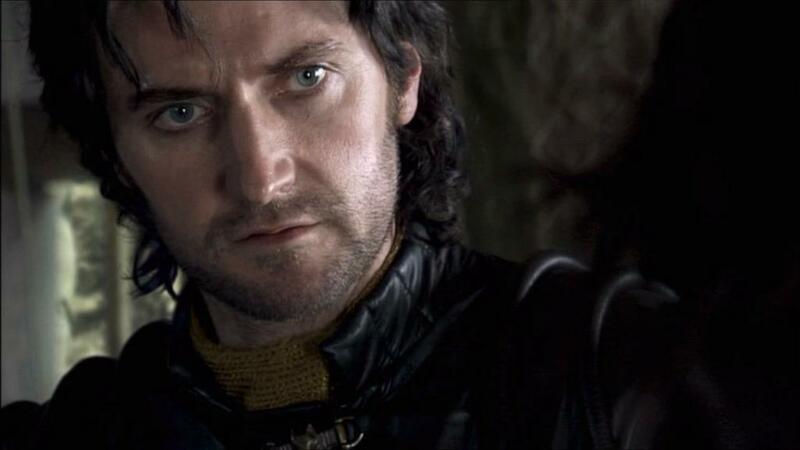 Today’s screencap of Richard Armitage as Sir Guy of Gisborne was contributed by trlibhart. She also recommended the song “Somebody That I Used to Know” by Gotye. Thanks bunches, trlibhart! First off, I cut out the Guy figure. I adjusted his coloring using the Tweaker filter from Xero Graphics. For the background over his right shoulder, I placed the gray part of the original screencap behind him. I’m not sure what possessed me, but under the influence of the music and my muse, I thought of the caption “Remember the future.” The font is Dukeplus and I applied a Bevel and Emboss effect. I duplicated this image and placed these new layers above a gray background. I set them to various blend modes until I was satisfied. The darkness is intentional. I duplicated and used this layer around the entire graphic, erasing parts that were unnecessary. 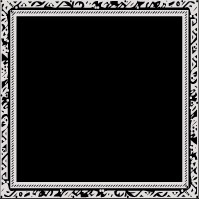 To darken it, I placed a black border atop it and lowered the opacity of this layer. Finally, I added a Curves adjustment layer over most of the other layers to brighten things a bit. If Guy was never hired as henchman/Master-at-Arms, what other career choices do you think would’ve suited him? This entry was posted in Collaborative Project, Graphics, richard armitage and tagged actor, gotye, graphic a day in may, graphics, guy of gisborne, lady marian, lucy griffiths, richard armitage, robin hood, somebody that i used to know. Bookmark the permalink. @trlibhart: LOL, well-said! Glad you enjoyed the graphic and I thank you very much for the excellent raw material of Guy and Gotye! I love what you did with his scin tones, bccmee. Great combination and siggie!. Thank you, trlibhart, for the picture choice! As another job choice for Guy, I think he would have been a good knight (though he did not have the required funds to get such a position) in the King’s army and his life would have taken an entirely different turn. Lovely pic, trlibhart, and another wonderful graphic, B. Once again, many thanks for taking the time to explain how you put it together. Great choice, trlibhart. Bcc, I love that you brightened the original. Such pretty eyes that man has! Love the Guy picture, love the graphic and I love the song that goes with this. If Guy wasnt wasting his time on silly Marion he could have married me!! If he were so inclined, Guy could have seduced and married Prince Geoffrey’s widow, Arthur of Brittainy’s mother. In that position, he could have changed history, enforced Richard I’s will for the succession, and successfully put down John’s bid for the throne, becoming Arthur’s regent — not king, but damned close. I’m very happy a Guy graphics was in the queue today! Wonderful graphic, bccmee! Love how you used the frame font. You are so clever!! 🙂 Great cap choice, trlibhart! Ooo Glorious Guy! Perfect in every way. Another fantastic graphic. Good choice of picture by trlibhart. If only Guy had been as prophetic as this siggie, Team #23. I could see Guy as a prototype trophy husband. Great choice of screencap trlibhart! Another day when I’ve been thrilled by the choice of picture, the music to accompany it and the finished graphic. Each picture is spectacular but together they make a combination. Thank you ladies. A lovely Sir Guy image, wonderfully enhanced with the design of the siggie! Poor Guy, such angst in his eyes and soul. Wonderful job improving the original picture which was a great choice, trlibhart! Now that we have heard RA sing how about a troubadour, in leather of course. Beautiful, gorgeous siggie of Guy! @Everyone: Such interesting choices for Sir Guy’s other career! Hmm, they all seem to have him still wearing leather…. 😉 Maybe he can combine them somehow: An alchemist / blacksmith / sheriff / Robin Hood / “Black Hawk” time-traveling Avenger / troubadour / trophy husband to Marian or Prince Geoffrey’s widow who tells good knight bedtime stories to the children. Thanks to those of you who voted in the TV Choice Awards. Richard Armitage may have made the “long list” for Chris Ryan’s Strike Back, but he didn’t win anything for that role. I wonder if he’ll make the “short list” for his super short appearance in Strike Back: Project Dawn. Oh, I really missed Sir Guy. * sigh * Great pictures choice trlibhart! Beautiful and very touching graphic Bccmee.♥Thank you both!